In February, more than 45,000 people descended on Orlando for the Healthcare Information and Management Society (HIMSS) annual conference. Often compared to the Consumer Electronics Show (CES), HIMSS is kind of the CES of the healthcare IT world. And much like CES, innovation, AI, cloud and security were themes heard over and over at the event. Let’s look at a few of the highlights. 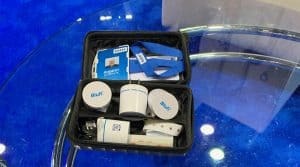 It’s always interesting to see the different types of technology present at HIMSS, and how those technologies integrate. Epson works with a number of partners, including Hyland, Acuant and Omnicell, to offer everything from retail pharmacy systems to electronic health records. 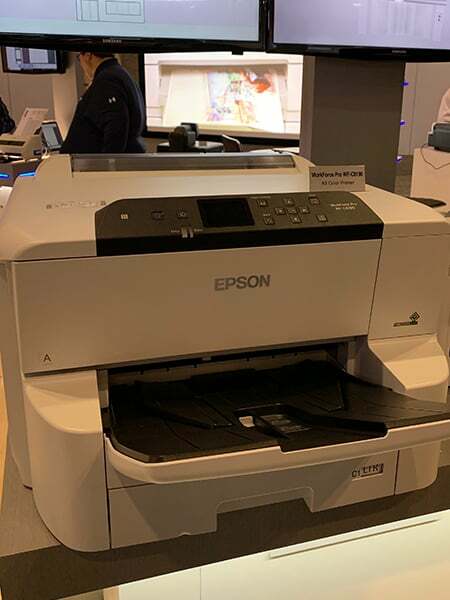 In addition to its receipt printers and scanners, which are ideal for the healthcare vertical, Epson also displayed its Workforce Pro devices. Healthcare, as a vertical in which color is desirable and costs are critical, is a natural for the line. 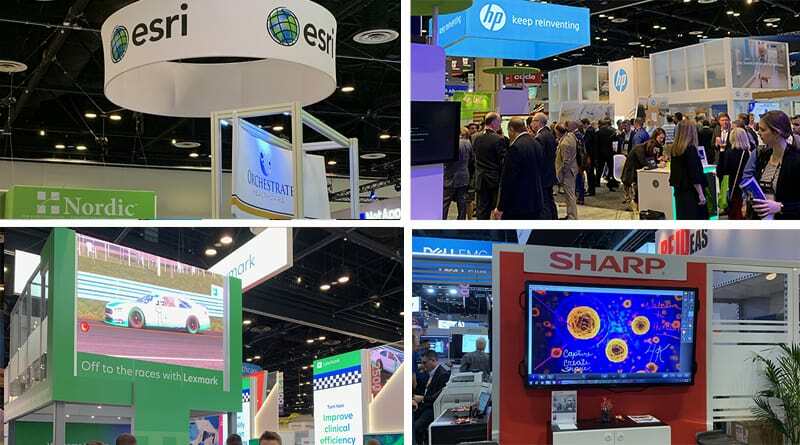 It’s interesting, in fact, to see the number of print devices at a high-tech show — but it’s not surprising, because paperwork still reigns supreme. Whether inputting existing paperwork, communicating it from one provider to another, or creating output, print is certainly not dead in the healthcare industry. 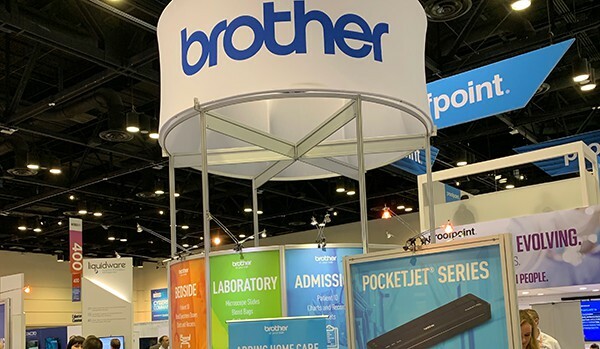 Brother was also present at the show, demonstrating how printers enable healthcare worker mobility through products that wirelessly print patient wristbands, labels, and full-page documents. How is all that paperwork transmitted? Most often, paperwork needed for communication is transmitted via fax. According to IDG numbers in a survey released by OpenText, 50 percent of all medical communications are done via some form of fax — and while 56 percent of that is electronic fax, 44 percent is still paper-based. OpenText is promoting its RightFax paperless faxing solution, combining fax and direct messaging. Direct messaging, designed specifically for the exchange of patient health information across EHR networks, is one key to interoperability. RICOH Healthcare Direct Solutions is also making the push toward direct messaging — in fact, signage at the booth encouraged users to “eliminate archaic practices such as fax.” The fax is still so prevalent in healthcare that this Vox article called it the “cockroach of American medicine.” Fax volume is actually growing in the healthcare system. 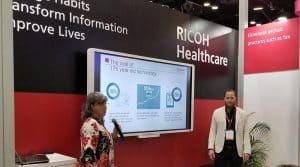 RICOH Healthcare is placing a major focus on changing that, and encouraging users to form new habits that will build meaningful collaboration and communication. An interesting conversation with Hyland puts a lot of this into perspective. When the Health Information Technology for Economic and Clinical Health (HITECH) Act went into effect in 2009, it incentivized the adoption of electronic health records. And that mostly worked. The problem is interoperability, defined by HIMSS as “the ability of different information systems, devices or applications to connect, in a coordinated manner, within and across organizational boundaries to access, exchange and cooperatively use data amongst stakeholders, with the goal of optimizing the health of individuals and populations.” It’s a mouthful, but it boils down to those electronic records not necessarily being useful or functional between ECR, ERP and other systems. The mandate for EHR was, in some ways, backward — it might have been better to require interoperability before mandating electronic records. Hyland is looking at bringing together unstructured content — documents, images, videos, etc. — that is only useful if it can get where it needs to be in appropriate use cases. 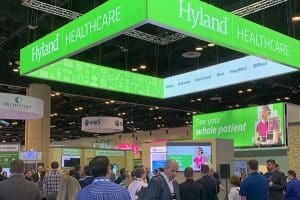 It showcased these connected healthcare solutions under the “see your whole patient” umbrella. Healthcare technology isn’t just about managing documents and information, of course. Companies like HID Global are taking advantage of the IoT to improve clinical workflows and eliminate bottlenecks with real-time location services. Clinical staff need to be able to monitor patients and equipment, and HID can electronically touch and validate both with its beacons, which can be put on almost anything, as pictured. 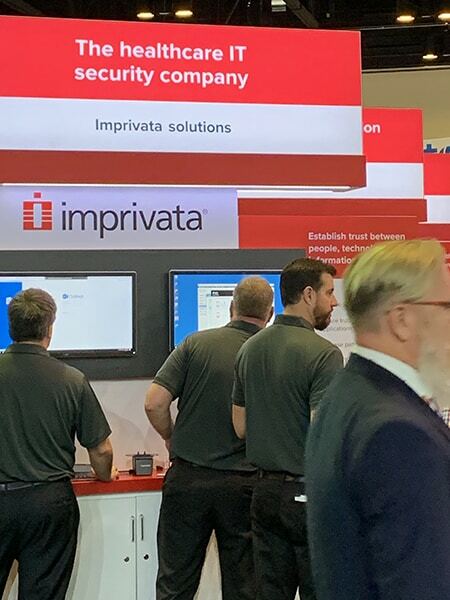 Healthcare security firm Imprivata showed several solutions at the show that work together to create robust security platforms for the market. 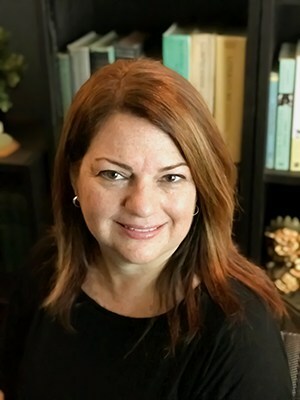 With the number of devices being used in healthcare exploding — iPads, iPhones and more in addition to traditional computers and systems found at nursing stations, for example — workflow must remain constant. Imprivata’s mobile device access enforces security without impeding workflow, and its new Proximity Aware leverages the power of Bluetooth to secure PHI on shared workstations. The company is also focused on the cloud, which was a constant throughout the show. While data centers still exist, there is a definite migration to cloud services being driven by security and the need for visibility. Cloud services are becoming more secure and more common in healthcare, as illustrated by the major presence of AWS, Google Cloud and Microsoft. 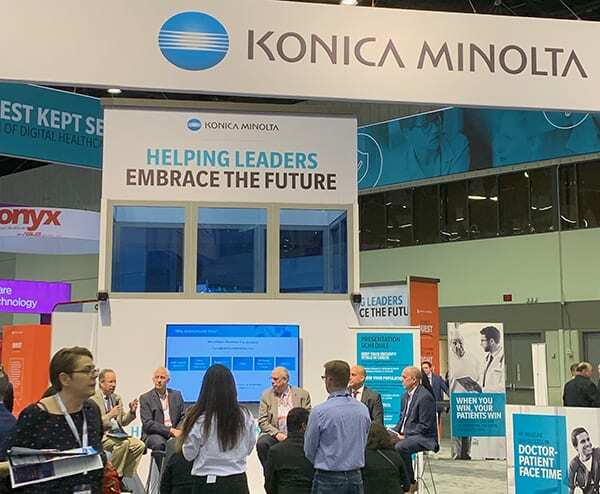 Konica Minolta, as usual, had a large presence, showcasing a number of its technologies including cybersecurity, interoperability and workflow automation, and even offered a free Dark Web scan at its booth. Konica Minolta also raised awareness and funds for the National Kidney Foundation. 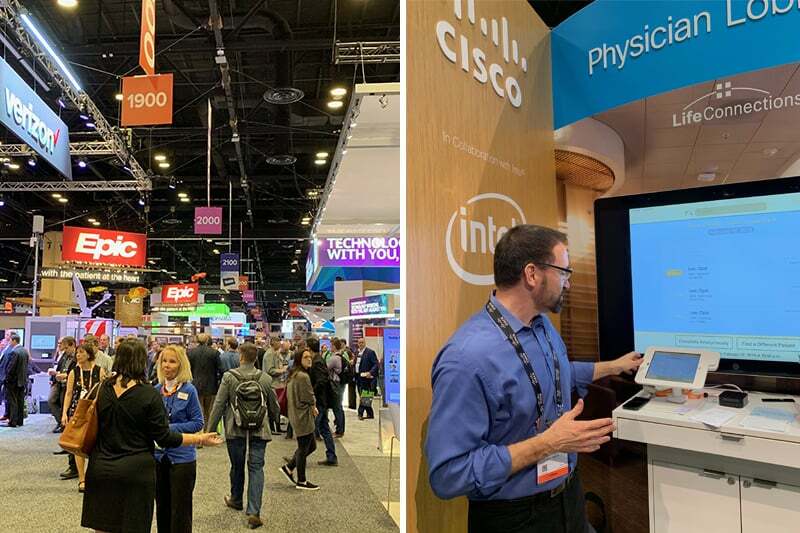 More big names with numerous healthcare solutions, such as Esri, HP, Lexmark, Sharp, Epic and Cisco, had a huge presence at HIMSS, showing off major solutions for the healthcare community.